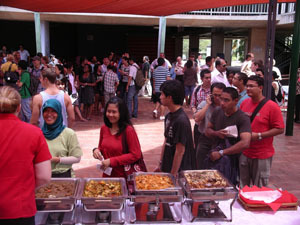 Students queue up to enjoy the International Student Lunch hosted by CDU’s International Office. Hundreds of students and guests turned out at Charles Darwin University’s (CDU) Casuarina campus for the International Student Lunch, hosted by CDU’s International Office. The biannual event is designed to welcome new international students to CDU and to allow invited community leaders to see the diversity of the international student population. More than 200 students, from the 500-strong international student population, were officially welcomed by Vice-Chancellor Professor Barney Glover. Guests included Minister for Business, Tourism, Trade, Asian Relations and Defence Support Dr Christopher Burns MLA and the Department of Chief Minister’s Director of Trade and Investment, Major Projects, Asian Relations and Trade, Mr Brian O’Gallagher. Other government officials in attendance included Department of Business and Employment’s Director of Business and Skilled Migration, Mrs Mary Martin, who is a regular at the biannual event and was on hand to advise the students on migration options and processes. Community leaders and representatives from the Multicultural Council of the Northern Territory also attended, as some 50 nationalities are represented within the CDU student population. The lunch is one of many activities run throughout the year by the International Office to ensure that students feel welcome and included at CDU.